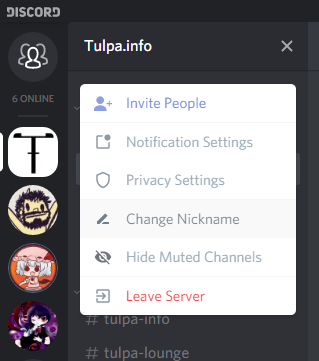 We'll get around to updating tulpa.info/chat to include the discord server this weekend. If there's channels that you'll actually use, suggest them up in our server discussion channel, there. I'm still learning to discord so please be patient. Please note: This is not replacing our IRC server, but rather it's an additional resource. RE: We have a discord server! Sure has been a long time, didn't expect to ever join a Tulpa Discord. But Discord is a lot easier to drop by and chat in than IRC. Back when Discord first came out, the Nickname feature didn't exist, so we couldn't have joined any groups lest our name would be "Reisen" constantly, or switching back and forth, which would be extremely suspicious to our friends. But hey, the feature exists now. This will change your visible name on a per-server basis, extremely useful for switching, possessing or even proxying if you're doing it enough. Avatar is still universal, however.